Many studies support that chemokine (C-X-C motif) ligand 1 (CXCL1) regulate tumor epithelial-stromal interactions involving in tumor growth and invasion. However, limited studies have been conducted on the expression and function of the CXCL1 gene in hepatocellular carcinoma (HCC). The mRNA and protein level expression of CXCL1 was examined in HCC tissues and cell lines. The expression of CXCL1 was correlated with clinicopathological features and follow-up data. Overexpression approaches were used to evaluate the biological functions of CXCL1 by MTT and matrigel invasion assays. Protein expression levels of CXCL1 and P65 were determined by western blot analysis. In this study, we found that CXCL1 expression was markedly upregulated in HCC tissues. Ectopic expression of CXCL1 significantly promoted HCC cells proliferation and invasion. Furthermore, CXCL1 promote cell invasion through NF-kB-dependent pathway. CXCL1 expression in HCC associated with clinical stage (P = 0.034) and distant metastasis (P = 0.028). Moreover, Patients with high CXCL1 expression level had poorer overall survival (OS;P = 0.027) than those with low CXCL1 expression. 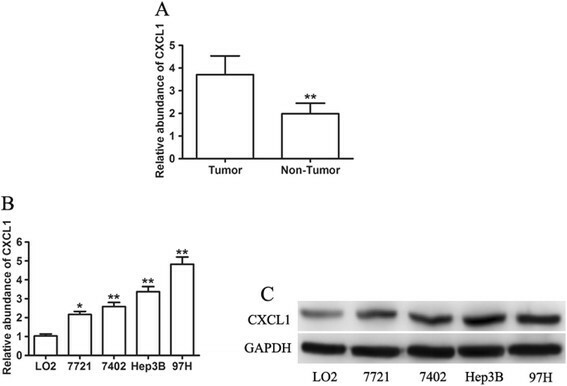 These data indicated that the CXCL1 upregulation may contribute to both the development and progression of HCC and this effect may be associated with increased proliferation and invasiveness mainly via regulating P65 expression. HCC is the third most leading cause of cancer death, and is the most common malignancy in eastern Asia, sub-Saharan Africa ,. Although significant advances have been made in surgery and chemotherapy, radiation, the improvement in long-term prognosis of patients with HCC in recent years is still unfavorable ,. A hallmark of the malignant phenotype is the uncontrolled of cell proliferation and invasive phenotype that allows cancer cells to survive ,. Therefore, a better understanding of the key factors in these processes is great demand to predict the characteristics of the malignancy and aid novel effective therapies for high-risk population. Chemokines are known to be crucial mediators of the inflammatory response and chemokines altered may result in the initiation and progression of cancers -. CXCL1, a member of the CXC group of chemokines family of proteins, was initially cloned from fibroblasts . Previous results showed that CXCL1 could contribute to inflammation response in the development of Alzheimer's disease and CXCL1 forcing-expression could induce angiogenesis through the ERK1/2 and EGF pathways ,. Its functions imply that CXCL1 is associated with tumor progression including tumor growth, angiogenesis and metastasis. Recent studies have revealed that CXCL1 is highly expressed in melanoma, breast cancer and bladder cancer -. However, there have been no reports on the gene function and prognosis associated with CXCL1 in HCC. It was known that activation of NF-kB involved in the development and progression of cancer such as proliferation, migration and invasion . Previous study have shown that NF-kB activation enhance HCC cell migration and invasion. But the molecular mechanism(s) by which CXCL1 contributes to the malignant phenotype of HCC via the NF-κB pathway has not been fully elucidated. In our current study, we showed the first evidence that CXCL1 was significantly up-regulated in HCC compared with matched adjacent non-cancerous liver tissues. The relationships with between CXCL1 expression and clinic pathological characters and the relapse-free survival after resection were further analyzed. Overexpression of CXCL1 in SMMC-7721and Bel-7402 cells enhanced cell proliferation and invasion. Mechanistically, we show for the first time that P65 is required for cell invasion. Our findings suggest that CXCL1 may represent a novel indicator of poor prognosis in HCC and may be a potential therapeutic target for gene therapy. As previously described, 48 primary HCC specimens and normal adjacent tissues were collected from patients who underwent complete resection at the Shanghai First People's Hospital between Dec 2004 and May 2007 and were diagnosed with hepatic carcinoma (HCC) using histological diagnoses . No local or systemic treatment had been received in these patients before surgical resection. Written informed consent was obtained from all patients involved in the study. This study was performed with the approval of the Medical Ethical Committee of Shanghai First People's Hospital and the ethical guidelines of the Declaration of Helsinki. All of the tissue samples were flash-frozen in liquid nitrogen immediately after collection and stored at -80°C until RNA was extracted. The human hepatoma cell lines (SMMC-7721, Bel-7402, Hep3B and MHCC-97H) and non-malignant liver cells (LO2) were purchased from the Shanghai Cell Bank of the Chinese Academy of Sciences (Shanghai, China) and cultured in High glucose Dulbecco's Modified Eagle Medium (DMEM) (HyClone, Shanghai, China) supplemented with 10% fetal bovine serum (FBS) (Invitrogen, Carlsbad, CA, USA), with 100 U/ml of penicillin G and 100 μg/ml of streptomycin at 37°C in a water-saturated atmosphere of 5% CO2. For studies assessing the effect of NF-κB inhibition, cells were treated the NF-κB inhibitor ammonium pyrrolidinedithiocarbamate (PDTC) (Sigma-Aldrich, Poole, UK) at a final concentration of 20 μM. As previously described , total RNA was isolated from HCC tissue specimens and cultured cells with TRIzol Reagent (Invitrogen) and then converted to first strand cDNA using iScript™ cDNA Synthesis Kit (Bio-Rad, CA, USA) according to the manufacturer's instructions. Real-time quantitative reverse-transcription polymerase chain reaction (qRT-PCR) was carried out using the SYBR Green PCR Master Mix (Toyobo, Osaka, Japan) according to the manufacturers' instructions by an ABI 7900HT real-time PCR system (Applied Biosystems, Foster City, CA, USA) and amplified with target gene specific primers. The primer sequences were as follows: 5′-GCCCAAACCGAAGTCATAGC-3′(sense) and 5′-GGCACAATCCAGGTGGCC-3′(antisense) for CXCL1; 5′-ACCCAGAAGACTGTGGATGG-3′(sense) and 5′-CAGTGAGCTTCCCGTTCAG-3′(antisense) for GAPDH. GAPDH was used as a loading control. The PCR reaction contained an initial denaturation at 95°C for 2 min, followed each PCR cycle by de-naturation at 95°C for 1 min, annealing and extension at 72°C for 1 min for a total of 40°Cycles. All experiments were performed in triplicate with three technical replicates. To overexpression of CXCL1, we obtained the coding sequence (CDS) fragment of CXCL1 by PCR using the following primers: forward, 5′-CCCAAGCTTATGGCCCGCGCTGCTCTC-3′ and reverse, 5′-AAAGGATCCTCAGTTGGATTTGTCACTGTTCA-3′ (including HindIII and BamHI sites with underline, respectively). The resulting PCR product was then subcloned into pCDNA3.1 (+) vector (Invitrogen) and named it pCDNA3.1-CXCL1. The sequence of CXCL1 was confirmed by DNA sequencing (Sangon, Shanghai, China). Subconfluent cells were transfected with CXCL1 or empty vectors using X-tremeGENE (Roche, Basel, Switzerland) according to the manufacturer's protocol. The expression of CXCL1 protein was confirmed 48 hours after transfection by western blot analyses. Cell proliferation assay was performed as recently described . Briefly, differences in the proliferative capacity of 7721 and 7402 cells with or without overexpression of CXCL1 were examined by the absorbance using coulter counter (Beckman Coulter, CA, USA). For the invasion assays, 24 hours after transfection, 3 × 104 cells in 100 μl serum-free media were added to the upper chamber of an insert (8-μm pore size, millepore) coated with Matrigel (BD, San Diego, CA, USA). 600 μl media containing 10% FBS were added to the lower chamber. After incubation for 24 hours, the cells remaining on the upper membrane were removed with a cotton swab, whereas the cells that had invaded through the membrane were fixed and stained with methanol and 0.1% crystal violet. The images were acquired and counted from five randomly selected fields using an IX71 inverted microscope (Olympus, Tokyo, Japan). Experiments were independently repeated in triplicate. As described before , aliquots of 40 μg of protein from each group was separated by 13% SDS-polyacrylamide gel electrophoresis (SDS-PAGE) and transferred onto a 0.22-μm polyvinylidene difluoride (PVDF) membrane (Millipore, Bedford, MA, USA). After blocking with 5% nonfat milk in TBS + 0.05% Tween™ 20 for 1 hour at room temperature, membranes were incubated with an Rabbit Anti-CXCL1 antibody (Proteintech, Chicago, IL, USA), Rabbit Anti-Phospho-NF-κB p65 (Ser536) antibody, Rabbit Anti-NF-κB P65 antibody (Cell signaling Technology, Beverly, MA, USA), or Anti-GAPDH (Bioworld, Nanjing, China) overnight at 4°C. Densitometric levels of CXCL1 signals were quantified and expressed as their ratio to GAPDH. Immunohistochemical analyses were performed as described previously , paraffin-embedded tumor specimens were cut into 4-μm-thick sections and mounted on silane-coated slides. The slides were then treated with a graded series of ethanol solution. 3% H2O2 was applied to block endogenous peroxide activity for 15 min at room temperature. Antigen retrieval was performed at 95°C in 0.01 M sodium citrate buffer (pH 6.0) for 30 min and sections were blocked with normal goat serum. The sections were then incubated with a primary antibody against CXCL1 (Proteintech) in a humidity chamber at 4°C overnight. After washing with phosphate-buffered saline (PBS), the slides were incubated for 60 min with the DAKO Envision+/HRP system (DAKO, Carpinteria, CA, USA) and counterstained with hematoxylin. Negative control sections were incubated with normal rabbit IgG instead of a specific primary antibody. Data are presented as the mean ± standard deviation (SD) from at least three independent experiments. Student's t test was employed to assess the differences between two groups and one-way analysis of variance (ANOVA) was used to analyze significant differences among three groups. Survival was determined using the Kaplan-Meier method, and the significance of the difference was evaluated using the log-rank test. P < 0.05 was considered to be statistically significant. All statistical analyses were performed with GraphPad Prism 5.0 software (La Jolla, CA, USA). It has been recently reported that CXCL1 is high expressed in melanoma, breast cancer and could be associated with tumor differentiation grade and disease-specific survival of bladder tumors ,,. To determine CXCL1 expression in HCC tissues, we use qRT-PCR to analyze mRNA of CXCL1 in 48 HCC tissues and marched adjacent non-cancerous tissue. The level of CXCL1 mRNA was significantly increased in cancerous tissues compared with corresponding non-cancerous tissues (p < 0.01) (Figure 1A). To confirm the association between the expression of CXCL1 and HCC, four human HCC cell lines (SMMC-7721, Bel-7402, Hep3B and MHCC-97H) and a normal liver cell (LO2) were selected to detect the expression levels of CXCL1 mRNA and protein by qRT-PCR and western blot. Among the five cell lines analyzed, CXCL1 mRNA levels were found higher expression in HCC cells compared to LO2 cells (Figure 1B). Consistent with the results of mRNA, a significant increase in CXCL1 protein levels was also found in HCC cells as assessed by western blot (Figure 1C). These data indicate that abnormal CXCL1 might play important roles in HCC tumorigenesis. Expression of CXCL1 in HCC tissue samples and HCC cell lines. (A) Determining the mRNA expression of CXCL1 in 48 cases of HCC tissues and corresponding nontumor tissues. (B) CXCL1 mRNA levels was measured by qRT-PCR as indicated HCC cell lines. (C) The protein expression levels of CXCL1 were determined by Western blot analysis in HCC cell lines. GAPDH was used as a loading control *P < 0.05, **P < 0.01. Increased expression of CXCL1 in HCC tissues was further confirmed by immunochemistry (IHC) staining using an antibody to CXCL1. Representative images of positive expression of CXCL1 IHC staining were show in Figure 2. Then we determined the association of CXCL1 expression level and clinicopathological implications of 68 HCC patients in Table 1. The results demonstrated that high CXCl1 expression was significantly associated with advanced clinical stages (p = 0.034) and distant metastasis (p = 0.028). However, there was no significant correlation between CXCL1 expression and patient age, gender, tumor diameter, tumor number, AFP, and liver capsule. Representative immunohistochemical staining of CXCL1 in HCC tissue. Representative image showed strong staining of CXCL1 (A), moderate staining of CXCL1 (B), nearly negative staining of CXCL1 (C) in HCC samples. All images were captured at 100× magnification. Abbreviations: AFP, alpha fetoprotein. One-way Analysis of Variance (ANOVA) test was performed. We further examined whether CXCL1 expression level correlated with prognosis of HCC patients after surgery resection. Overall survival (OS) curves were plotted according to CXCL1 expression level by the Kaplan Meier analysis and log-rank test, and the results were presented in Figure 3. Remarkably, CXCL1-positive expression indicated a shorter overall survival time of patients (median OS: 39 Months) compared with CXCL1-negative expression (median OS: 64 Months). These results together suggested upregulated expression of CXCL1 in HCC was significantly correlated with patients' survival time. Kaplan-Meier analysis of HCC survival rates in relation to CXCL1 protein expression. Overall survival rates of patients with high (n = 33) and low (n = 15) CXCL1 expression. To further address the biological role of CXCL1 in HCC, we investigated the effect of overexpression of CXCL1 on cell proliferation and invasion. The over-expressed cell lines were named as 7721-CXCL1 or 7402-CXCL1, while the matched control cell lines were named as 7721-vector or 7402- vector, respectively. As measured by western blotting analysis, two HCC cell lines 7721 and 7402 transfected with pCDNA3.1-CXCL1 had at least 4-fold higher levels of CXCL1 than the control (Figure 2A). MTT assay revealed that cell growth was significantly increased in CDNA3.1-CXCL1 transfected 7721 cells and 7402 cells (Figure 4B and C).Similarly, the migratory potential of 7721-CXCL1 and 7402-CXCL1 cells was significantly enhanced compared to 7721-vector or 7402- vector, respectively (p < 0.01, Figure 4D). 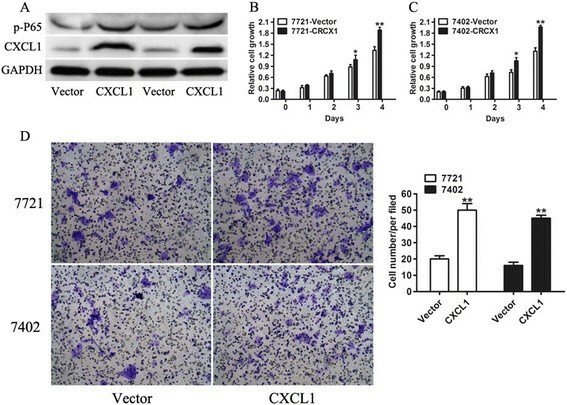 The effect of CXCL1 on cell proliferation and invasion in 7721 and 7402 cell lines. (A) CXCL1 and p-P65 expression in the control and CXCL1-transfected cells was determined by Western blotting. GAPDH was used as a loading control. (B and C) Cell proliferation of CXCL1 was assessed in 7721 and 7402 cells by MTT at the indicated time. (D) Representative images of cells with or without CXCL1 transfection that had migrated into the lower chamber were shown. Quantitative analysis of cell invasion was assessed by invasion assay. Cancer cell invasion is key step in metastasis that is a primary cause of cancer-related death. Since that CXCL1 were shown to be important for HCC cell proliferation and invasion, we sought to key signaling pathway responsible for CXCL1-induced cell invasion. It has been previously shown that CXCL1 increases cell migration and invasion through NF-κB/HDAC1 epigenetic regulation in prostate cancer , and it has also been previously established that nuclear factor-kappa B (NF-κB) positively medicated the expression of CXCL1 through binding to the CXCL1 promoter in melanoma cells . Therefore, we sought to determine whether NF-κB was required for CXCL1-induced cell proliferation and invasion. Consistent with previous reports , we observed a marked increase in p-P65 protein levels in 7721-CXCL1 and 7402-CXCL1 cells (Figure 5A). To investigate whether NF-κB signaling pathway plays a crucial role in CXCL1-induced cell invasion in HCC cells, we blocked NF-κB pathway of 7721-CXCL1 and 7402-CXCL1 cells using NF-κB inhibitor, PDTC (Figure 5A). Our results demonstrated that the stimulatory effects of CXCL1 on cell invasion were significantly extenuated by specific inhibition of PDTC (Figure 5B), suggesting that CXCL1 activated NF-κB pathway play a critical role in CXCL1-enhanced cell invasion. P65 involved in CXCL1-induced cancer cell invasion. (A) Effect of NF-κB inhibitors on CXCL1-induced the protein expression of p-P65 in 7721 and 7402 transfected with CXCL1. (B) HCC cells 7721 and 7402 transfected with CXCL1 were treated with or without PDTC (100 μM) for 6 hours and showed reduced invasion activity compared with the negative control. Overexpression of CXCL1 has been found in various cancers and correlates with poor prognosis ,,,. However, recent studies have shown that CXCL1 negatively associated with non-small cell lung cancers, but its biological functions were not further explored . However, little is known about the functional role of CXCL1 in HCC. We are, to our knowledge, the first group evaluating the expression and prognostic impact of CXCL1 in HCC. In our present study, we found that the mRNA level CXCL1 was significantly increased in HCC tissues compared to matched normal tissues, which suggests that CXCL1 may promote tumor growth in HCC. Consistent with pervious results, the upregulation of CXCL1 was observed in HCC cells compared to a non-malignant liver cell-LO2 both at mRNA and protein levels. Similar results were also observed in other human cancer, such as colon, skin, bladder cancers, prostate cancer, and breast cancers -,,, in which the overexpression of the CXCL1 gene was often observed and involved in inflammatory environment to cancer initiation. It is plausible that overexpression of CXCL1 may play an important role in HCC tumorigenesis. Further correlation analyses indicated that the high expression of CXCL1 was significantly correlated with clinical stage and distant metastasis of HCC patients, suggesting that high CXCL1 expression might associate with the progression of HCC. 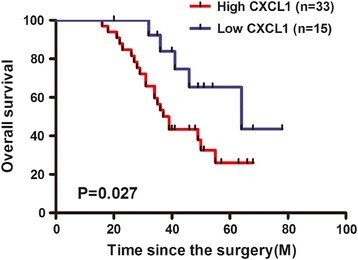 In addition, the overall survival of patients with high CXCL1 was lower than that of patients with low CXCL1. With regard to the gene function, we used 7721 and 7402 cell lines with low CXCL1 to establish useful method for investigating the biological functions and potential mechanisms underlying the growth and invasion of HCC cells. Overexpression of CXCL1 in 7721 and 7402 cells significantly increased cell growth/proliferation. In addition, Overexpression of CXCL1 also enhanced cell invasion. This result was consist with previous studies that showed that CXCL1 was involved in cell proliferation or/and tumor metastasis. Taken together, these data indicated that CXCL1 may be involved in carcinogenesis and development of HCC, and act as an oncogene in HCC. The role of NF-κB has been reported to regulate the expressions of many genes which were associated with several aspects of tumor progress, including cell proliferation, migration, invasion, apoptosis and angiogenesis ,. Interestingly, CXCL1-induced nuclear translocation of NF-κB have been shown to play a crucial role in CXCL1-mediated cell progression . Other studies found that NF-κB integrated the promoter of CXCL1 and enhanced the expression of CXCL1 . Then we focused on CXCL1/ NF-κB signaling pathway in HCC. As we expected, CXCL1 overexpression resulted in NF-κB activity that was critical for promoting malignant behavior of HCC cells. Furthermore, our findings showed that cells treated with an NF-κB inhibitor PDTC attenuated CXCL1-induced cell invasion. These results suggested that overexpression of CXCL1 enhances activation of the NF-κB pathway and that it cooperates with this pathway to stimulate proliferation and invasion. Taken together, our findings provided the first evidence that CXCL1 was significantly increased in HCC tissues and also revealed novel insights into the mechanism that there exists a CXCL1/ NF-κB positive feedback loop in HCC. ZC, XW and LQ participated in the design of this study, and they both performed the statistical analysis. ZC carried out the study, together with BF and BD, YZ collected important background information. ZC drafted the manuscript. BF, BD and YZ participated in the design and helped to draft the manuscript. All authors read and approved the final manuscript.